Walking for water has been the life story of many women from developing countries. Who are they? A woman living in a world of water hovers above our world. Who is she? What is her connection to these women who spend their days gathering water for their families? Through the eyes of a woman from her world of water, an exploration into the lives of six different women on their journey to find water is taking place. Each of these women has encountered uniquely different life experiences from their explorations, gatherings and surroundings. It is through her eyes that we see stories of love in its many infinite forms and the sacrifices that we must make in our determination to survive. The beautiful discovery of realizing one’s individuality gives way to the daily 9 to 5 grid of systematic existence. Some will follow their dreams, while others will choose to forego their dreams to the realities of their life. At the end, what will your memories hold for you? Through her eyes, we experience their lives. Through her eyes, we experience our lives. Through her eyes, we are all connected. 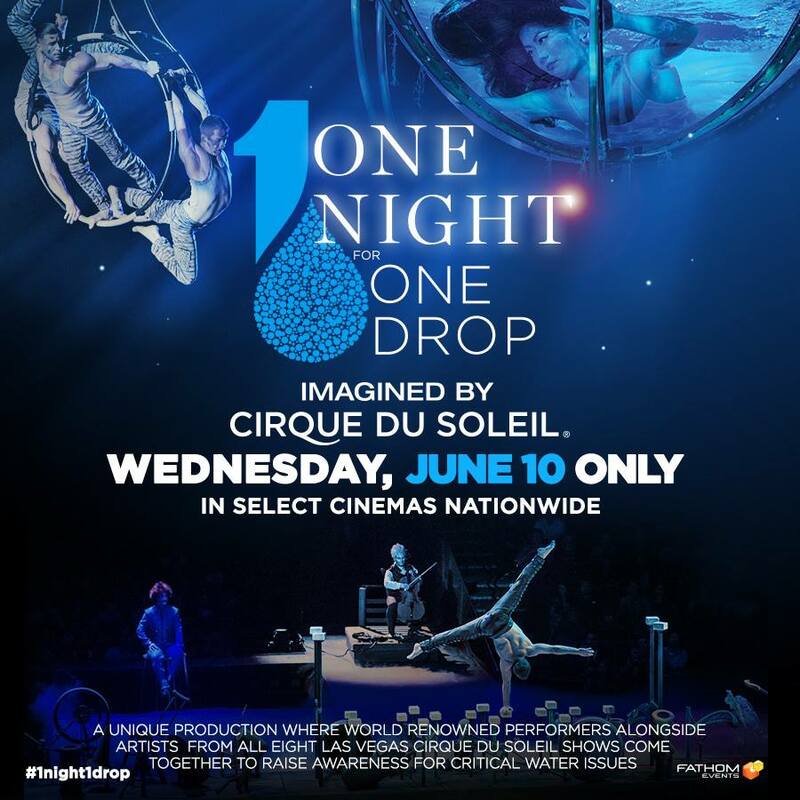 Fathom Events is thrilled to bring One Night for ONE DROP Imagined by Cirque du Soleil® to select cinemas nationwide in an incredible one-night event on Wednesday, June 10 at 7:30 p.m. (local time). 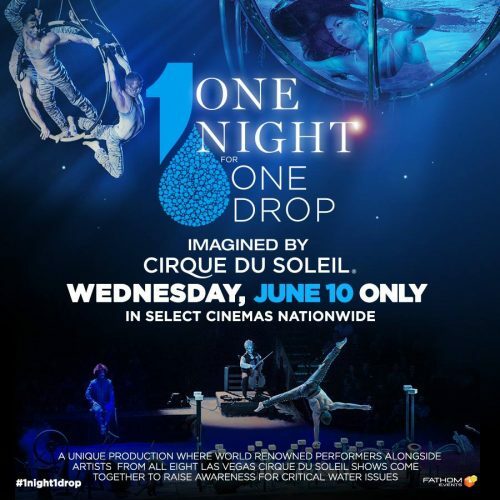 One Night for ONE DROP is a completely original performance that occurred when world renowned performers, alongside artists from all eight Las Vegas Cirque du Soleil shows, volunteered their time for the One Drop Foundation to help raise awareness for global water issues. Produced and created by Mukhtar O.S. Mukhtar, this cinema event includes the performance captured in March of this year at The Beatles™ LOVE™ Theatre at The Mirage along with additional behind-the-scenes footage.